After ten years of the longest bull market in history, your view of the present may depend on which metaphor you choose. For example, if you’re crazy bullish some may think you are “whistling past the graveyard.” Meanwhile if you’re bearish, you may be thinking that “Nero is fiddling as Rome burns.” However, from a trading standpoint it’s best to be pragmatic, in which case it is best to view the glass as neither half full nor half empty but as one that still contains fluid. I’m not taking this market lightly. It’s clear that the global economy is slowing rapidly while central banks continue to move at glacial speed even as trading algorithms respond to headlines at the speed of light and price and trend changes swiftly follow. Unfortunately this is the world we live in. As I noted last week: “the take home message is how quickly the central banks start easing if the data continues to slow and how the markets respond.” Accordingly, when the bad news hit the wires and the central banks delivered little in the way of actionable monetary policy, the market, as it did in Q4, sold off aggressively. So where does that leave the markets? Well, unless something else happens we are now fully at the mercy of the algos and how they respond to the headlines as the central banks hope to get lucky. And while that may sound pessimistic, consider the fact that every major market decline is followed by a major rally, eventually. Remember that in Q4 2018, the rapid algo fueled selling made it feel as if the world was coming apart, while in fact January and February the algos delivered sterling opportunities on the long side. Calendar : U.S. inflation data, U.S. durable goods, China industrial production and U.S. retail sales. There is also a key Brexit vote and U.S. Federal Reserve Chairman Jerome Powell is scheduled to appear on “60 Minutes,” on Sunday. Big Picture : The third year of the Presidential Cycle (2019) is traditionally bullish for stocks. But seasonality alone can’t hold up stocks if central banks don’t respond to conditions quickly enough. Monetary Policy : Central banks are no longer raising interest rates and markets are increasingly impatient as economic data continues to show weakness. Meanwhile, the big three: the Federal Reserve, the ECB, and the People’s Bank of China are not showing signs of being in a hurry to ease policy aggressively enough anytime soon because they are essentially out of options. Risk : Headline risk is rising. Think U.S.-China trade war, global tariffs, slowing economic data, politics. Of the four, it seems politics is starting to get near some sort of boiling point. Market Behavior : When good news and bad news leads to selling, life is going to be difficult. What to do : Stay cool. Trade the market. The New York Stock Exchange Advance Decline line (NYAD) remains the go-to indicator for the market’s trend. Over the last two weeks, based on the behavior of NYAD, I’ve noted that some sort of consolidation or outright correction was overdue. And the action this past week has proven this observation to be correct. 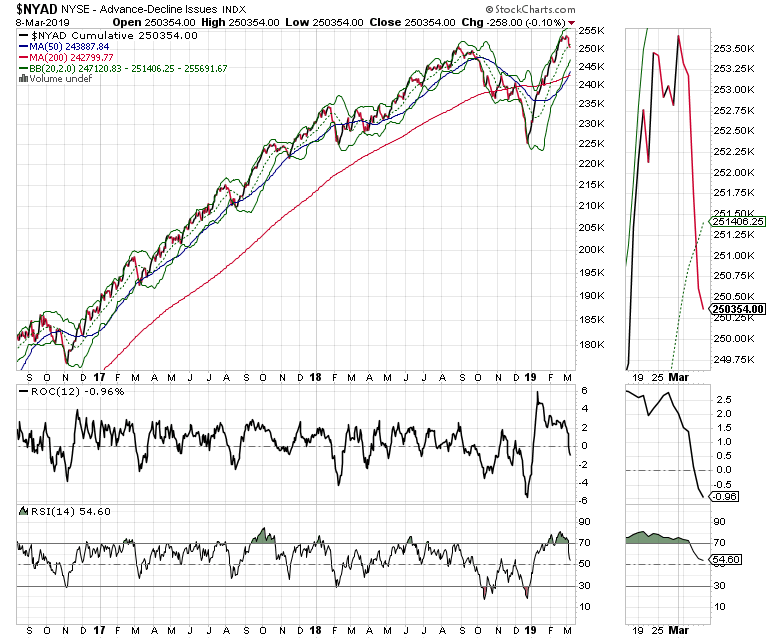 Indeed, the NYAD is now telling us that the short term trend is in danger of having reversed to the down side. Especially worrisome is the breakdown of the ROC indicator, which measures momentum, having fallen below zero. This suggests that momentum to the down side is now picking up steam. Meanwhile the RSI has dropped to 50 and could move lower if the selling persists. 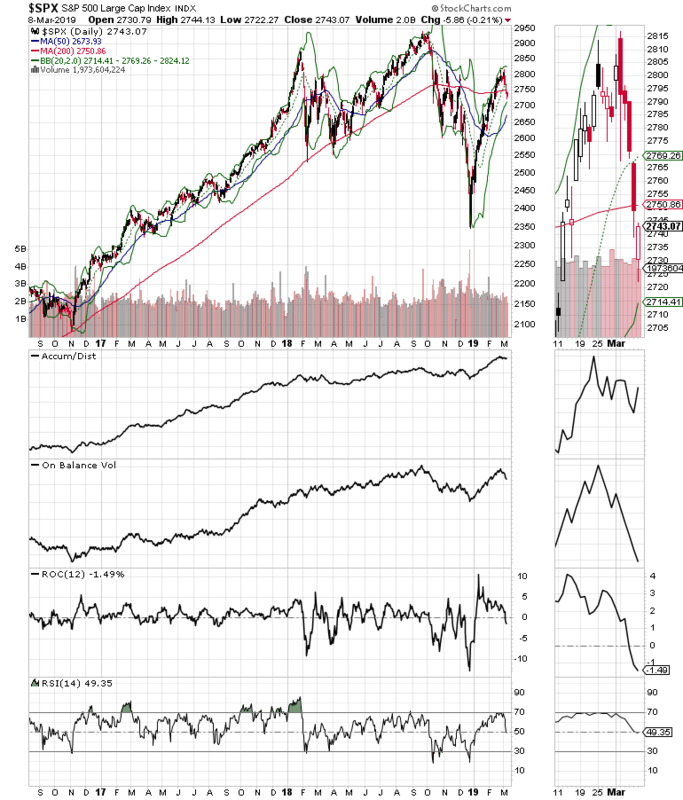 For their part, the S & P 500 (SPX) and the Nasdaq 100 (NDX) indexes went along with NYAD and are both struggling to move back above their 200-day moving averages after breaking below this key support level. This is a crucial juncture for the market since the 200-day line is the dividing line between bull and bear trends. 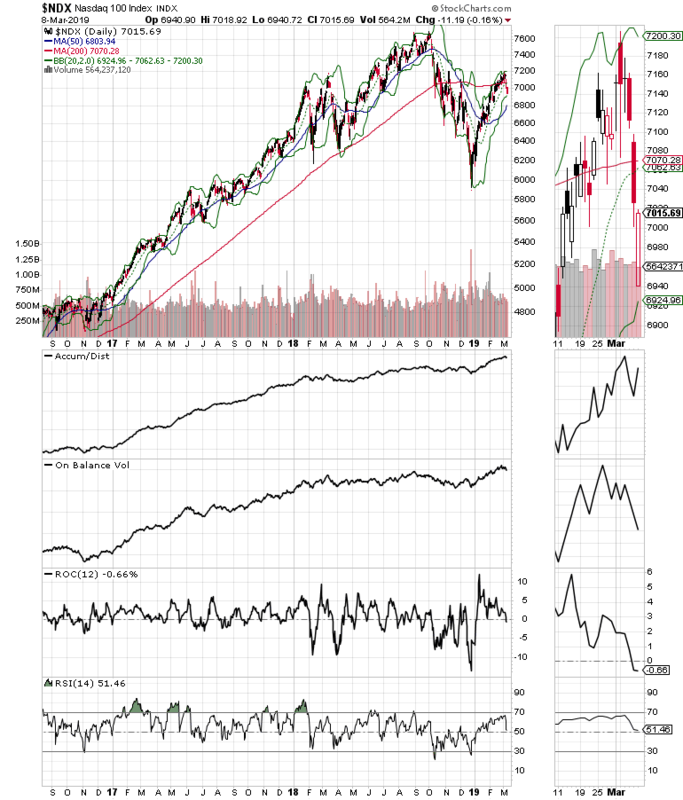 Thus, if both these indexes remain below this key indicator, the odds of lower stock prices are on the rise and the bears will be back in charge, perhaps with equal or greater force than what we saw in the fourth quarter of 2018. Note the rolling over of the ROC indicator for both indexes, indicating a breakdown of momentum to the up side. This rise in weakness was confirmed by the On Balance Volume (OBV) and the RSI indicators. Trading is both an intellectual as well as a practical pursuit. It pays to be aware of the big picture as well as the details. This bull market is now ten years old, the longest in history. It was fueled by historically low interest rates which, at least in the U.S. were reversed by the Federal Reserve until recently. But if you take a step back it’s clear that beyond those two characteristics, this market is not much different than any other market in history; the major influence on stock prices is the general trend of interest rates. Where this market is different than past markets is in the speed that it moves due to the influence of robot trading algorithms. As a result, what used to take weeks to develop now often occurs in hours or days. Thus, in order to survive traders must act rapidly. So while this market could be headed down in a hurry, the flip side is that at some point, we will be able to buy stocks at lower prices and perhaps in a shorter period of time than anyone expects. Accordingly, consider this an opportunity to hedge, go short if the opportunity rises, to use options to cut risk, and to put a buy list together for when the bull trend returns. The sun will rise again. Be prepared. JoeDuarteInTheMoneyOptions.com is independently operated and solely funded by subscriber fees. This web site and the content provided is meant for educational purposes only and is not a solicitation to buy or sell any securities or investments. All sources of information are believed to be accurate, or as otherwise stated. Dr. Duarte and the publishers, partners, and staff of joeduarteinthemoneyoptions.com have no financial interest in any of the sources used. For independent investment advice consult your financial advisor. The analysis and conclusions reached on JoeDuarteInTheMoneyOptions.com are the sole property of Dr. Joe Duarte.